What products are retailers in the industry raving about this October? “The Drive InStore 4mph car portable mobility scooter has been a really good seller this month. This is due to the fact it is unbranded from the manufacturer and so we can brand it ourselves, giving it a unique name of our own. “TPG DisableAids Ltd is a multi-disciplined retailer that covers a whole range of solutions for our customers. One of our staple offerings is the AJ Ways Chatsworth Riser / Recliner chair. Now whilst there are many riser recliners on the market, they are not all the same. We choose to sell this as a quality solution because we know it is built to a really high standard and is actually covered by a seven-year warranty. It has a solid beech wood frame which is doweled and glued with a proper seat suspension system that stands the test of time. We have found other, less expensive chairs to be made up with poor quality fibre board or used offcuts of plywood which is just stapled together which allows twisting and creaking, utilising cheap foam inserts for padding. 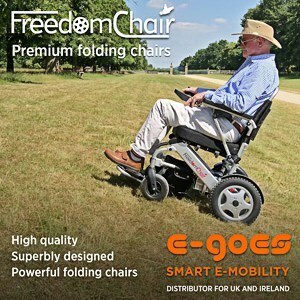 The ability to have the chair tailored to size for our customers further enhance the flexibility of this chair. “The Pride Apex lite has proven incredibly popular this month for us. We are based in a busy seaside town with a large number of caravan parks in and around the area, therefore people are looking for a simple, lightweight and robust car boot scooter to enable them to make the most of their break.